We collected the majority of metadata history records for Intuitpayments.com. 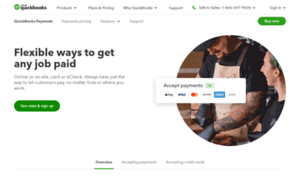 Intuit Payments has an elaborated description which rather positively influences the efficiency of search engines index and hence improves positions of the domain. The description and keywords of Intuitpayments were last changed more than a year ago. Intuit Merchant Services offers easy payment solutions and credit card processing. Never miss a sale. Free mobile credit card reader, no commitment.